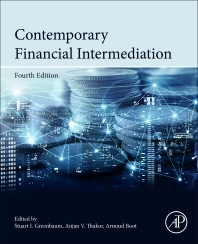 Contemporary Financial Intermediation, 4th Edition by Greenbaum, Thakor, and Boot continues to offer a distinctive approach to the study of financial markets and institutions by presenting an integrated portrait that puts information and economic reasoning at the core. Instead of primarily naming and describing markets, regulations, and institutions as is common, Contemporary Financial Intermediation explores the subtlety, plasticity and fragility of financial institutions and credit markets. In this new edition every chapter has been updated and pedagogical supplements have been enhanced. For the financial sector, the best preprofessional training explains the reasons why markets, institutions, and regulators evolve they do, why we suffer recurring financial crises occur and how we typically react to them. Our textbook demands more in terms of quantitative skills and analysis, but its ability to teach about the forces shaping the financial world is unmatched. PART II: WHAT IS FINANCIAL INTERMEDIATION? Stuart Greenbaum is a leading authority on banks. Formerly dean of the John M. Olin School of Business at Washington University in St. Louis, he spent twenty years at the Kellogg Graduate School of Management at Northwestern University, where he was the Director of the Banking Research Center and the Norman Strunk Distinguished Professor of Financial Institutions. Three times he was appointed to the Federal Savings and Loan Advisory Council and was twice officially commended for extraordinary public service. He is founding editor of the Journal of Financial Intermediation. As the John E. Simon Professor of Finance and Senior Associate Dean of Programs at the Olin School of Business, Washington University, St. Louis, Anjan Thakor works in both academia and the business world. Prior to joining the Olin School, he was Edward J. Frey Professor of Banking and Finance at the Ross School of Business, University of Michigan, where he also served as chairman of the Finance area. He has worked with many companies, including Whirlpool Corporation, Allision Engine Co., Citigroup, RR Donnelley, Dana Corporation, Anheuser-Busch, Zenith Corporation, Lincoln National Corporation, and J.P. Morgan. Arnoud Boot is professor of Corporate Finance and Financial Markets at the University of Amsterdam and chairman of the European Finance Association (EFA). He is chairman of the Bank Council of the Dutch Central Bank (DNB), member of the Scientific Council for Government Policy (WRR) and member of the Royal Netherlands Academy of Arts and Sciences (KNAW). He is also a research fellow at the Centre for Economic Policy Research (CEPR) in London. Prior to his current positions, he was a member of the Inaugural Advisory Committee of the European Systemic Risk Board (ESRB), partner in the Finance and Strategy Practice at McKinsey & Co. and a faculty member at the J.L. Kellogg Graduate School of Management at Northwestern University in Chicago. He was also Bertil Danielsson Visiting Professor at the Stockholm School of Economics and Olin Fellow at Cornell University. He is the past chairman of the Royal Netherlands Economics Association. In addition to his academic activities, Arnoud Boot advises extensively on ownership structure issues, particularly related to the public/private domain, and is consultant to several financial institutions and corporations. He is a non-executive director of several corporations and agencies. His research focuses on corporate finance and financial institutions. His publications have appeared in major academic journals, such as the Journal of Finance, American Economic Review, Review of Financial Studies, and the Journal of Financial Intermediation.